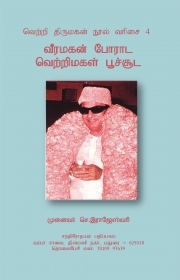 Description of "Veera Magan Porada Vetri Magal Poochooda... (வீரமகன் போராட வெற்றி மகள் பூச்சூட...)"
Book 4 of Vetri Thirumagan MGR series of books details how MGR used his knowledge of movies and filmmaking to create a larger than life following for himself. Dr Rajeswari Chellaiah has a Ph.D. in translation studies and has published numerous research papers on translation. Most notably, her work on the life and times of MGR are well received and highly acclaimed. Reviews of "Veera Magan Porada Vetri Magal Poochooda... (வீரமகன் போராட வெற்றி மகள் பூச்சூட...)"